United Arab Emirates-based Falcon Technologies International, a premium manufacturer of professional optical data storage media and archival solutions provider, has launched its new Smart Glossy printable layer – a disc surface that is able to provide personalized graphics and labels brighter and shinier than ever before. There were plenty of ways to create the labels for the media, says FTI. The most common method was to print the design on circular pieces of paper and glue it to the surface, but times have changed and now it is impossible to glue discs that spin at over 5000 RPM instead of 33 RPM back in the days of vinyl. Some manufacturers even tried to implement a technology of 'in-drive label burning,' but the labels made with this technology were typically black and white and very faded. 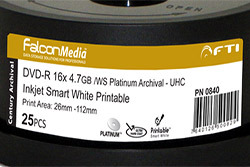 FalconMEDIA Century Archival showed outstanding results during the internal and third-party benchmarking tests: data stored on these professional archival discs stays accessible and integer for more than 500 years – timeframe that is enough to archive data for almost seven future generations of the humanity, claims the company. Also, FTI’s Falcom MEDIA Century Archival CDs and DVDs with golden and platinum reflective layers is a product specifically tailored to store data for long periods of time. Century Archival DVDs demonstrated capability of storing data for up to 200 years, whereas the Century Archival CDs has a longevity in excess of 400 years, making this product line the most durable and secure archival digital media product available in the market today.